A new star, a possible nova, has been discovered in Cygnus the Swan, the summer's signature constellation. This transient object was discovered on 31 March by the prolific Japanese nova-discovering duo of Koichi Nishiyama of Kurume, Japan and Fujio Kabashima of Miyaki, Japan, while it was shining at magnitude +10.9. They used a 105-mm f/4 camera lens attached to an electronic CCD camera (SBIG STL630E) for two 40-second exposures. Shortly after they noticed the new object it was immediately confirmed by CCD images taken through their 0.40-m (16-inch) Meade 200R f/9.8 reflector. They had previously imaged the same field on 27 March and there was no trace of the new object down to the frame's limiting magnitude of +13.4 but they spotted the object on their survey frame taken on 30 March, the night before the discovery, when it was significantly fainter at magnitude +12.4. Before reporting their discovery they undertook careful checks of on-line Digital Sky Survey images and asteroidal databases so as to eliminate the chance that it was a known object. 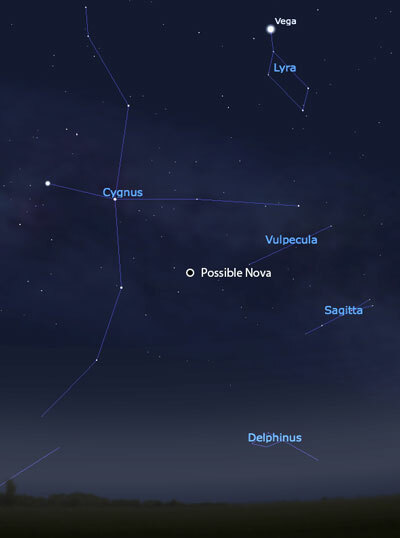 Location of the Nova in Cygnus. Star map: Stellarium. The discovery was posted on the IAU Central Bureau for Astronomical Telegram's (CBAT) 'Transient Objects Confirmation Page' and it was observed on 1 April by Gianluca Masi, Francesca Nocentini and Patrick Schmeer, remotely using the 17-inch (431-mm) f/6.8 corrected Dall-Kirkham robotic unit part of the Virtual Telescope Project facility, at Bellatrix Astronomical Observatory in Ceccano, Italy. Twenty-second exposures, unfiltered, showed the source at magnitude +11. They also obtain several low resolution spectra (100 lines/mm grating, with a dispersion of 34.5 angstroms/pixel) remotely using the 14-inch (355-mm)robotic unit part of the Virtual Telescope Project facility in Ceccano, Italy. After co-adding several images, clear H-alpha emission was seen. The precise position of the nova is R.A. 20h 21m 42.34s, Decl. +31° 03' 29.8", which places it 1.7° north-west of 41 Cygni (mag. +4), which itself is about five degrees wet of the famous Veil Nebula supernova remnant in the extreme south of Cygnus close to the border with Vulpecula. From the UK the more northerly regions of Cygnus are circumpolar and are well up in the morning east-north-east sky by 3am. The nova is too far south to be circumpolar but is 25 degrees above the horizon at 3am BST. There's no way of predicting what this nova will do next but it has brightened by one and a half magnitudes in 24 hours to be within easy imaging range with modest equipment and it should be seen by visual observers with 'scopes in the 100-150-mm (four to six-inch) range. It's likely that professional and amateur telescopes alike will be swung towards the nova in the coming weeks and through these follow-up observations, both optically (through visual brightness estimates), CCD photometry, and spectroscopically, the nova can be classified and a valuable light-curve established. Novae are identified by their spectra and are further classified by studying their light curves, specifically how fast their rise to maximum and subsequent decline is. Fast novae (Na) are recognised by a very quick rise to maximum, staying there for a few days at most and a steep decline, reaching three magnitudes below maximum within 110 days. Slow novae (Nb) generally exhibit a gradual rise to maximum that can be sustained for several weeks, even months, followed by an initially slow fade that quickens. Often a sudden dip occurs, followed by a second rise. The three-magnitude decrease from maximum may take 150 days or more. Very slow novae (Nc) are a small group of novae that can have maxima that last years and an ultra-slow decline. The progenitors often show one to two magnitude variability preceding the nova event. Amateurs are in a prime position to make a valuable contribution to help further our understanding of novae. Please send any images and observing reports, including brightness estimates, to Astronomy Now, the British Astronomical Association and the Society for Popular Astronomy. The word nova means 'new' in Latin and you can see why such 'new star' events were historically labelled. Novae appear out of nowhere, rise to maximum quickly where they can burst into naked-eye brilliance before more often than not fading away quickly, unlike supernovae that can hang around for months. It is likely many events were missed in the past and even in our technological era it is proving a difficult task to spot all events despite the seemingly blanket coverage of the night sky by survey telescopes and cameras, amateur and professional alike. Novae belong to the class of stars called cataclysmic variable stars, where a very close binary containing a white dwarf - an extremely compact stellar remnant - as the primary star and a cooler, larger main sequence (i.e. Sun-like) star forming the secondary. The explosive event is caused by the intense attraction of the white dwarf inexorably drawing material from its hapless main sequence victim. The material doesn't fall directly onto the surface of the white dwarf but gathers to form a so-called accretion disc surrounding the remnant. Over time, the hydrogen in the disc will spiral down onto the white dwarf's surface, forming a layer that is intensely compressed by the monumental gravitational forces at the surface, raising the temperature ever-closer to critical levels. Every 1,000 to 100,000 years enough hydrogen accumulates to increase the temperature enough to trigger a thermonuclear reaction at the surface, producing a titanic explosion that is equivalent to over 10,000 times the Sun's luminosity. For us on Earth, this can cause the quiescent system to increase in brightness by anything from seven to an incredible sixteen magnitudes. Despite the incredible destruction going on around it the system will survive basically unchanged, with the accretion building up again towards the next outburst. This is what is described as a 'classical nova', not to be confused with 'recurrent novae', which are systems where the outbursts are smaller and more frequent (for example the RS Ophiuchi system) and 'dwarf novae' of white and red dwarf stars that have typical amplitudes of two to six magnitudes over much shorter time scales.